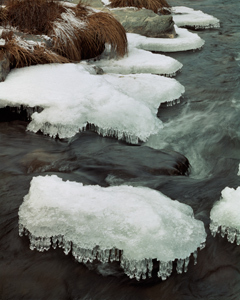 "The Divine Jewelry of Winter" -John Muir, Ice Plates On Indian Creek II, Northern Sierra Nevada, California, 1976 by Philip Hyde. This will be one of several original Cibachrome prints made by Philip Hyde in the Camera Obscura Exhibition. STAY TUNED: The Entire Exhibition Will Be Displayed On the Camera Obscura Website Starting The Week Before The Show. The Camera Obscura Gallery presents two exhibitions of photographs. Gallery I will showcase the exquisite color and black & white landscape work of the late photographer and environmentalist, Philip Hyde, titled Philip Hyde’s Mountain Landscapes, and will include both modern prints and rare early vintage prints. Gallery II will feature Carolyn Guild’s contemplative black & white landscape and nature imagery, Affirmations of Spirit. This exhibition offers a continuous time line of landscape photography from the past into the present as Carolyn Guild first began exhibiting her work around the time Philip Hyde passed on in 2006. In 1951 the Sierra Club and Wilderness Society sent Philip Hyde on the world’s first conservation photography assignment. As a result of his trip to Dinosaur National Monument in Northwestern Colorado and Utah, Philip Hyde became photographer for the first book published for a conservation cause: “This Is Dinosaur: Echo Park Country” edited by Wallace Stegner. Born in San Francisco in 1921, landscape photographer Philip Hyde dedicated his life and 60 years of full-time photography to conservation. Hyde first exhibited his original black and white prints in national venues in 1947 with his Group f.64 mentors from the California School of Fine Arts: Ansel Adams, Edward Weston and Imogen Cunningham. Lead Instructor, Minor White, also curated several exhibitions of his work for major museums in the Eastern U. S. including George Eastman House and the Metropolitan Museum of Art. Hyde’s color prints have also been widely exhibited and collected by major national museums. His photographs are part of over 50 permanent collections. The Sierra Club Exhibit Format Series popularized the coffee table photography book and the modern environmental movement began. Rachel Carson’s “Silent Spring” was published in 1962—the same year color came to landscape photography. The Sierra Club published Eliot Porter’s “In Wildness Is The Preservation of the World” with quotes by Henry David Thoreau and Philip Hyde’s “Island In Time: The Point Reyes Peninsula.” Philip Hyde’s book helped raise funds to acquire the land for Pt. Reyes National Seashore. His innovations in composition and style in the Series influenced a generation of landscape photographers and helped establish or expand such national treasures as the Grand Canyon, Dinosaur National Monument, Canyonlands, the Coast Redwoods, Pt. Reyes, North Cascades, Wind River Range, King’s Canyon, Big Sur and many others. The Camera Obscura Gallery exhibited Philip Hyde in the 1960s and takes great pleasure in a second showing entitled Philip Hyde’s Mountain Landscapes. David Leland Hyde, Ardis and Philip Hyde’s son, will be present at the opening reception October 1 and will speak at 7 pm about his parent’s western wilderness adventures. The exhibition will continue through November 13. Philip Hyde’s Mountain Landscapes will include original black and white silver prints, dye transfer prints, and Cibachrome prints, as well as Philip Hyde authorized archival digital prints made by Carr Clifton, a protégé and nationally recognized photographer. Looks great. I’ll contact my friend in Colorado. Hi Alta, yes please tell your friend(s) in Colorado. Thank you. Looks like great show, I wish I could make it there! How do you feel the digital and vintage prints compare, David? Hi Sharon, thank you for asking an excellent, provoking question. To give the short answer: we are working hard to get them as close as possible. Generally the digital method, incorporating color control from Photoshop, realizes a better quality print that is often closer to “reality” than the older color printing processes. The digital print is lighter, brighter, has a greater range of color, more detail in the shadows and is usually sharper. At the same time, my father had a certain art to his printing technique. The Cibachrome prints and especially the dye transfer prints have a certain soft vibrance and tone that just can’t be beat by anything digital. The Digital process is technically far superior, but missing the soul that Dad’s prints have. I like your use of the term “soft vibrance”. I wonder if it could be achieved digitally with a careful choice of paper combined with controlling ink saturation. I’ll have to experiment. Perhaps that way and others. Let me know how the experiments go. I have had a number of printers talk big about what they could do with the photographs but nobody has done near what my Dad could do in some aspects. He had tremendous attention to detail and shades of colors. The idea not only of using colors acurately, but also lightly, rather than heavily. Or in Black and White Printing using the full spectrum of shades. I wrote sloppily….I know I couldn’t duplicate your father’s work, especially since I have never seen an original print of his. But the term soft vibrance…that I would like to work for in a few prints of mine. Sharon, thanks for responding. I wasn’t on your case. Knowing you mainly from these discussions and having never met in person, I would say that if anyone could, you would probably print as well as Dad after a similar amount of time invested in developing printing skills. I have never seen any of your prints, but I would venture to say that you are probably well on your way, guessing from your approach and attention to quality in your images. What I was criticizing is the tendency of printers today to be overconfident of their tools because they are superior, but to have some humility because great prints are not made solely by better processes in my observation. Inspirational indeed! As you’ve stated what has such a lasting impact for me with Philip Hyde’s work is not just the art, but the cultural significance it has played in the conservation movement. Inspiring to create lasting and meaningful art is one thing, but being able to leverage that art to further a movement is awe inspiring. I wish I could make the event in Denver. I’ll have to wait for such a showing here in San Francisco. Hi Jim, thank you for your kind words for Dad, reminding us of the primary meaning of his photography, just as he helped others see the impact that could be made with images.